Display the estimated delivery date or text for a product or a category of products to notify your clients when product can be delivered or shipped, taking into account holidays and delivery cut-off time. Show estimated delivery date on product pages, checkout page, in transactional emails and other pages of your store. Select estimated delivery date type for each category or individual product. Exclude weekends and holidays from estimated date of arrival. 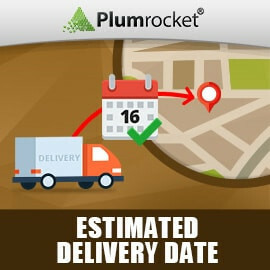 Estimated Delivery Date Magento Extension from Plumrocket helps customers find out the expected delivery date of the product or service before and after the order was placed. It displays the expected delivery date and estimated shipping dates on product pages, category pages, in emails and other pages of your store, taking into account holidays and delivery cut-off time. Both dates can be configured as dynamic date ranges, static dates or simple text. Admin can choose to inherit estimated delivery dates from parent categories or set different settings for each product separately. Products and categories can inherit delivery dates from the parent category making it very easy and quick to start using the extension. Admin can specify Delivery and Shipping Cut-off Time. Order creation date can be excluded from calculations if an order is placed after the specified time during business hours. Renamed "Exclude Order Creation Date from Calculations if Order is Placed After" option to "Delivery/Shipping Cut-Off Time"
Added Delivery and Shipping Cut-off Time. Now order creation date can be excluded from calculations if Order is placed after the specified time during business hours. Added ability to display estimated delivery & shipping dates on various store pages and transactional emails, such as: Category Page, Product Page, Shopping Cart Page, Checkout Page, Order Confirmation Email, Invoice Email, Shipment Email, Order Page in Admin Panel, etc. Fixed block layout and multi-language support. Added new fields: "Business Days For Delivery", "Business Days To Shipping". Moved option "Holidays" to extension system configuration. Fixed bug with delivery block placement on Category page. Changed dates formatting in accordance to Magento system settings. Fixed the file controlling the Module Update. Fixed the Attributes location and grouped them in the product configuration section in the backend. Code is moved from "/frontend/default" to "/frontend/base"